With simple tools, but consummate skill and artistry, a small group called the Children of Peace crafted a dramatic architectural testament to their vision of a society founded on the values of peace, equality and social justice. That building, now a national historic site known as the Sharon Temple, is celebrating its 175th anniversary in 2007. Although they are now little known, this “plain folk” of former Quakers led the country’s first farmers’ co-operative & credit union, built its first shelter for the homeless, and played a key role in the development of democracy, or “responsible government” (in effect, self-rule) in Canada. They worked closely with William Lyon Mackenzie in the pre-Rebellion period. And against overwhelming odds the group secured the election of both “fathers of responsible government” — Robert Baldwin and Louis-Hippolyte LaFontaine — in the 4th Riding of York in the formative years before Canadian confederation. 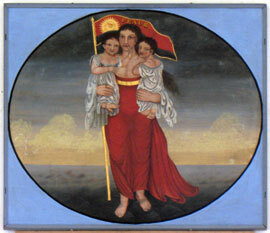 The Temple of the Children of Peace in the village of Sharon – with its Ark of the Covenant, inspirational Banners, Pipe and Barrel Organs and Jacob’s Ladder – was completed in the emerging Upper Canada of 1832. It lives on as the centerpiece of the Sharon Temple National Historic Site, which encompasses nine historic buildings in a park setting. It is one of Canada’s first examples of historic preservation, and has been a museum since 1917. 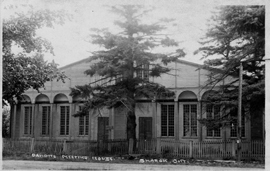 The Sharon Temple was saved by the York Pioneer and Historical Society in 1917. The abandoned building was transformed into a museum, making it one of Canada’s earliest examples of historic preservation. The heavily laden symbolism of the banners hanging in the Temple emphasizes the union of ancient Jewish and Christian dispensations: the Old and the New Testaments. Most people think the Temple was a church. It was not. Their church, or “meeting house,” was down the street. The Temple had only one purpose; the Children of Peace met there once monthly to raise alms for the poor. For them, it was a symbol of the importance of charity. The Second Meetinghouse of the Children of Peace was completed in 1842. For many years it was as important a landmark as the Temple. 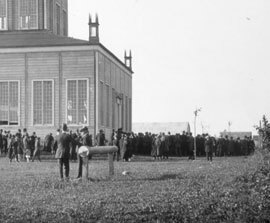 It was demolished in 1912, prompting the York Pioneers to save the Temple from a similar fate. This exhibit was produced in partnership with the Sharon Temple Museum Society. Dr. Albert Schrauwers, writer and curator of this exhibit, is a professor of Anthropology at York University, and author of the book, Awaiting the Millennium: The Children of Peace and the Village of Hope, 1812-1889, and coauthor of 4Square: An introduction to the Sharon Temple National Historic Site, to the Children of Peace who made it, and to their place in the history of Canada before Canada (with Mark Fram). He is also a board member of the Sharon Temple Museum Society. 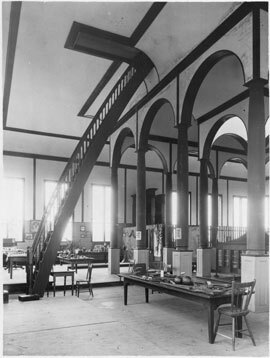 Note: Copyright for images not from the collection of the Archives of Ontario is held by the lending institutions or individuals and should not be reproduced without their permission.